do—unlimited access to junk food, a jam-packed schedule, a tight budget, and a love of delicious food. 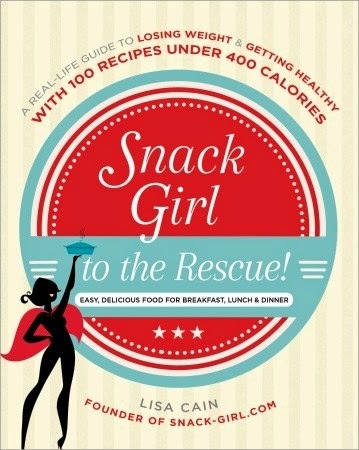 So in Snack Girl to the Rescue, she has created a way to make small changes that will make a difference in how you eat and live. On her mega-popular blog Snack-Girl.com, she shares the simple secrets and delicious, healthful recipes that have helped keep her budget and her body in check. without sacrificing fun or flavor. Now with Snack Girl to the Rescue! A Real-Life Guide to Losing Weight and Getting Healthy with 100 Recipes Under 400 Calories, Lisa is sharing her best, tried and true advice on avoiding common weight-loss pitfalls, shopping healthier on a budget, and getting in shape, along with 100 recipes for fun, quick, and affordable meals and snacks—all of which clock in under 400 calories and are Weight Watchers friendly! There are no gimmicks, no short cuts, it's just how you're supposed to live: a healthy balanced life. Lisa shows us in this book, that nobody is perfect—but with a few minor tweaks, you can change your lifestyle, be happy and be healthy. Ok, nobody likes to diet. I mean really LIKES to "diet" especially me. Eating Healthy is always a good plan, but can be expensive and difficult at times so I was really looking forward to having some healthier snack recipes and ideas when I chose this book for a review. Well, I didn't realize that this isn't a cookbook of healthy snacks, but a story of the author's journey to making changes in her lifestyle and diet that helped her lose weight and keep it off. After she tried many well-known popular diets, Lisa Cain decided there had to be something she could do that would not only work, but keep working and make a difference. In "Snack Girl to the Rescue" she explains how she makes little changes and looks at food a different way that really made a huge impact on her life and weight. Just those little things make a huge difference in eating habits and healthier attitudes towards food. Don't be disappointed though, there are many recipes in the back of the book that are pretty simple and easy to make. Some of her ideas are ones I will personally implement in my life to kick start my healthier me attitude and others just don't suit me personally. This is a great book to have on hand for ideas of how to make healthier and better choices when eating at home or on the go. Disclosure: I received free the item(s) mentioned in this post in exchange for my honest review through the Blogging for Books reviewer program. Regardless ~ All my reviews are my honest and personal opinion. I am disclosing this in accordance with the Federal Trade Commission’s 16 CFR, Part 255: “Guides Concerning the Use of Endorsements and Testimonials in Advertising.”.